I’m interested! Although i’m 12 and so and so on my drawing. Since the only thing I can draw and be satisfied with is manga, I wouldn’t be able to help you in the people category. Quite sorry. If I had any skill as an artist, I’d try, but I surely don’t. Anyway, I love Japanese wear. It’s just much more colorful and formal than in America. I quite like this! Aww Liana, thanks for the link and kind words! I’m honoured to be counted among your internet buddies :D You’re right about practicing—it really is the only sure way to get better at drawing or at anything. I like your idea of creating a people-sketching group-project for accountability. It might do me some good to join in, to get some variety into my system. I worry that if I keep up drawing for my blog and little else, soon I won’t remember how to draw people that aren’t me!! I love this mouse doll and the story to go with it. What a sweet gift for your mum :D I think the “wall” kimono is my favourite—that flower pattern is the cutest! I would love to join your thing but im not really good at drawing people. 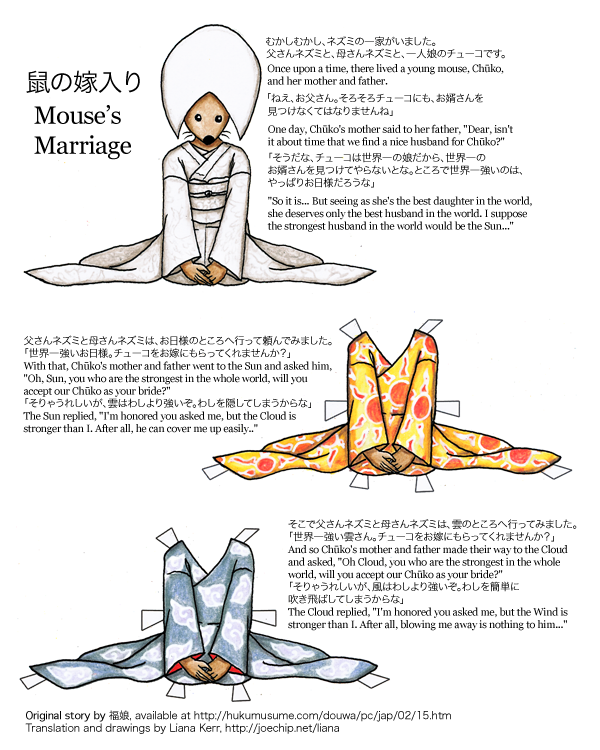 I love the mouse paper doll. She’s darling. I remember when I was a kid I had a set of Victorian Mice Paper Dolls… I think they are still in my collection somewhere… Anyway, this made me think of that. 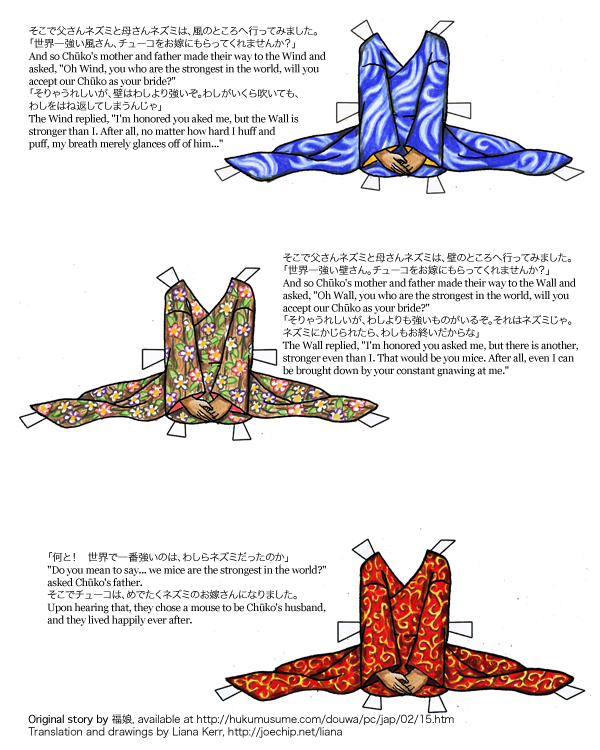 First off, I love all of your paperdoll designs. It’s really interesting to see what new things are here whenever I check back. Not to mention they are always so beautifully drawn and colored. Secondly, the drawing blog idea sounds wonderful! I really need to practice figure drawing myself but can never find the motivation. ^^; So something like this would be wonderful. i have to say WHAT EVER HAPPENED TO MERMAID MONDAY??? i’m sorry but I’ve been coming to the site a lot and i noticed there haven’t been any new mermaid sketched :'( what happened to them? Very cute paper doll. I bet your mom loved it. Posty sketchies! Please? Onegai? My mommy loves the mousie, too! What better way to ring in the new year than with this adorable mousie paper doll? It is SO well done, great job. I treasure my pdf printed on card stock. The translation is beautifully done. Happy New Year Liana. Thank you for it all. These are so cute, and I enjoyed the story you based them on. I’d say I’d join in on a challenge too, but every time I do something like that to practice drawing so I’ll get better, I get frustrated with how bad I am and quit. truth be told, i have no natural aptitude for drawing whatsoever. what i can get away with now is the result of painstaking practice over the last three or four years. i decided i wanted to learn and little by little have been hacking away at it. 20 minutes a day and you’ll be bopping along in no time at all! ~ and i would love to join any forum or blog you set up and share my own work as i continue to learn. you know where to find me! Count another one in for the group sketching thing. I need to practice drawing people as well, and I just got a really great art book for christmas, so if I don’t I’ll feel bad for wasting a really nice gift. And my boyfriend will give me all sorts of poo for not using his gift. For everyone who’s expressed interest in the drawing group, I’ll be e-mailing you soon. Brian’s setting up a forum for me on joechip.net that we can use. As for Mermaid Monday, I officially dropped it when I moved to drawing three days a week, since I didn’t want to lock 1/3rd of my drawings into being one thing. I would like to join with the drawing group, too. Sorry Liana but I cant do the drawing group now. I’m upset, but i just cant. Sorry!!! And I do love mouse! I would be interested. I LOVE to draw. Medieval dresses are I what I tend to draw. I would be interested in joining your drawing group. Although I am young and do not have good drawing skills. Cute mouse by the way!